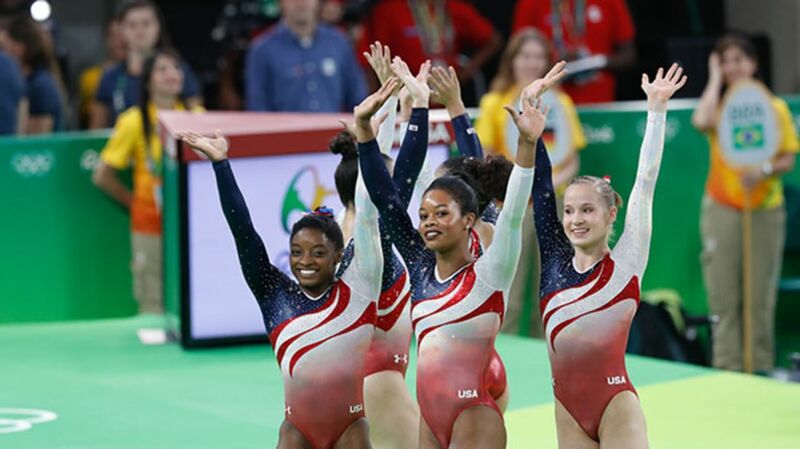 The competition leotards worn by the Team USA gymnasts at the 2016 Olympics are the most expensive the team has ever seen, according to TIME. Each is worth up to $1200—thanks largely to the swirls of as many as 5000 Swarovski crystals bedazzling the tops and arms. Other factors contribute to the price, too. The leotards—made by Under Armour and gymnastics outfitter GK Elite—take two years to design, and each one is custom-made for the athlete using a process that requires three fittings. Because the gymnasts' bodies are unique, and sticking or bulging fabric could cost them at the competition, there’s no one standard cut for the design. But really, it’s all about the bedazzling. “It’s difficult for me to imagine how we could get more crystals on,” Kelly McKeown, executive vice president for design and corporate relations at GK Elite, told The New York Times. At this year’s Olympics, “we may have hit peak crystal,” McKeown says. As the Times points out, there’s good reason for all that flash: The light-catching crystals help small girls stand out in a huge stadium. Women’s gymnastics is one of the most-watched Olympic sports, and this year, Simone Biles’s performances are some of the most-anticipated of the entire games. Plus, Martha Karolyi, coordinator for the U.S. women’s team, is reportedly a big fan of sparkle. And as CNNMoney notes, GK Elite has a relatively new machine with robotic arms to sew on the crystals—which makes achieving significant sparkle much faster and more painless. Each Team USA gymnast receives eight competition leotards and 12 training leotards. Of course, the $1200 cost is what the leotards would fetch on the open market. (They’d likely earn more once worn by the Olympians.) However, the gymnasts don’t pay for their own uniforms. USA Gymnastics, the national governing board, covers the cost. You can also get your own replica version from GK Elite for $59.99 or $79.99—much less pricey, but also much less sparkly. They’re not the only Olympics uniforms costing a pretty penny. The preppy Ralph Lauren-designed ensembles for the U.S. athletes at the Opening Ceremonies would cost you more than $1500 if you bought the retail versions online. Sadly, the light-up jacket Michael Phelps wore at the opening ceremonies isn’t currently available for purchase—and no word on the cost.